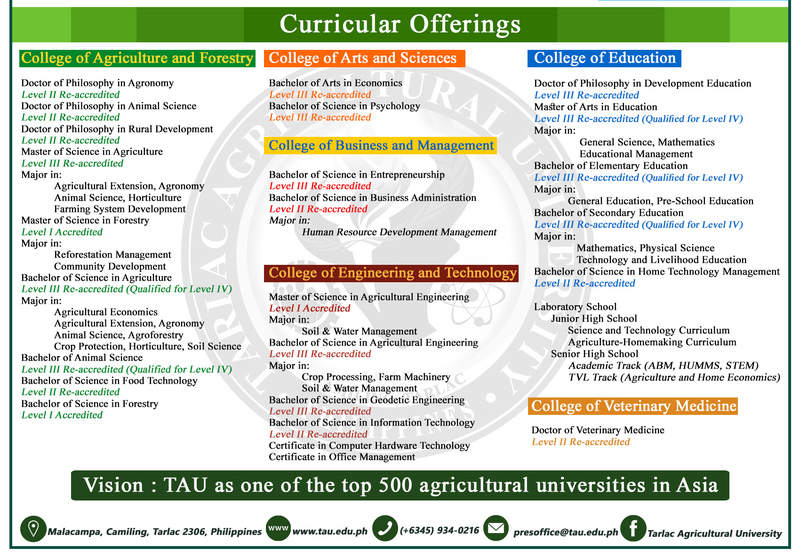 Now that the Tarlac Agricultural University (TAU) has landed her feet on higher grounds, bigger responsibilities also come along its way. Infrastructures take the front line of priorities. Thus to better serve clients, several projects have been laid down towards the long envisioned world class facilities. As of December 2016, 14 infrastructure projects have been completed. These include the (1) rehabilitation of the Engineering Rice Mill Laboratory, (2) rehabilitation of the College of Veterinary Medicine (CVM) Large Animal Dissecting Shed, (3) rehabilitation of Don Onofre Martin Hall of the College of Agriculture and Forestry (CAF), (4) rehabilitation of the Poultry Laboratory of CVM, (5) rehabilitation in Integrated Science Laboratory, (6) rehabilitation of Voc-Tech Building of the College of Education (CED), (7) rehabilitation and conversion of the Food Center to Technology Laboratory Building, (8) rehabilitation of the Post-harvest Laboratory, (9) repair of tennis court perimeter fence and pathway, (10) drainage pipes, (11) repair of Executive House garage, (12) repair and rehabilitation of piggery storage, (13) repair and rehabilitation of Integrated Laboratory experiment area, and (14) repair and rehabilitation of Farm Machinery shed. Alongside these accomplishments are other projects that are still being constructed in different parts of the campus. These include the Phase 1 construction of two-storey General Education Building, Home Technology Building, TAU Agritourism Hostel, Bamboo Training Hostel, and Information Technology (IT) building. In addition, the Physical Education Laboratory Track Oval and Soccer Field, the Engineering Building, the CED Annex Building, the Psychology Laboratory Building, Continuing Education Center, Agri-home Building and the bleachers of the Covered Court are currently being rehabilitated. More development projects are also coming in 2017. In fact, according to Engr. Rochelle E. Vibar, University Engineer 1, the upcoming projects have already been approved by the Department of Budget and Management (DBM) amounting to P82, 410, 000.00. Such projects include the Phase 2 construction of the Home Tech Building, GenEd Building, Bamboo Training Center and Agritourism Hotel. Also allocated for the budget are the construction of classroom buildings for CAF and CET, rehabilitation of campus road networks and drainage system and finally the improvement of campus electrical power distribution and building ventilation system. With all these projects, the university is clearly being transformed to become a world class institution that delivers up-to-date and quality instruction which only proves that it can definitely give justice to its status as a university.